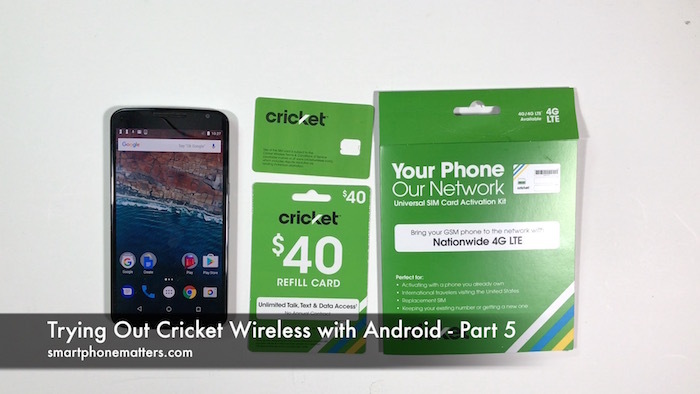 In my previous articles and videos I showed you how I signed up for Cricket Wireless and am using it with my iPhone SE. As part of trying out the service, I also wanted to make sure it worked with Android too. So I decided to put the SIM into my Google Nexus 6 and see how well it worked. My Nexus 6 is using Android 6, which is currently not the latest verison of Android, but many recent high end smartphones are still using Android 6. I ran a few tests to make sure I could place and receive phone calls, send and receive both SMS text messages as well as MMS picture messages and that I could use cellular data as well. All of these features are working. I decided to skip the SpeedTests on Android for now as I didn’t want to use up all of this month’s high speed cellular data for the month as I am only using a 1GB plan. After I put the Cricket SIM in the Nexus 6 I checked the APN settings. The phone automatically set the APN settings for Cricket Wireless. I did not have to do anything myself. I also checked cricketwireless.com and I found the APN settings there too. I’ve copied below just in case someone needs them for a different phone. I was glad to see that Cricket is working with my Nexus 6 that is using Android 6. I haven’t had the chance with other Android phone such as Samsung or LG nor any other version of Android but given my experience I’d think it setup should be easy.